Please join us on Saturday 18th July – 10.00am onwards. Bring along your spade, trowel and gardening gloves! Five Alive This weekend – 12th July – tomorrow in fact. We are looking at: Rivalry and Reconciliation: – ALL WELCOME. 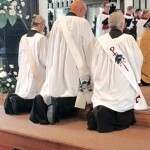 Rev’d Charlene ordained a Priest! 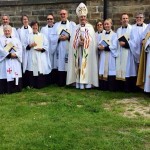 The Bishop of Huddersfield with the new Priests. Congratulations to Rev’d Charlene on being ordained a Priest. 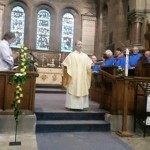 What a wonderful weekend we had both at Huddersfield Parish Church for the Ordination Service on the Saturday on a most beautiful day and then back in Meltham on the Sunday for her first mass. Both services were absolutely tremendous. Please pray for Rev’d Charlene as she continues her ministry among us here in the Parish of Christ the King. You can now subscribe to receive email notifications when items are added to the website – news, special events and other interesting items. Hopefully, all the info you need to know will appear on the website, meaning you get to know what’s happening as soon as it is posted. Please submit your email in the box on the Welcome page. You will receive a confirmation email first, before you start to receive any updates, and can unsubscribe at any time to stop the email notifications. ….you will notice that this notice is not worth noticing, so do not notice this notice! Just testing the website functionality, and remember writing this one on my pencil case at school. Hilarious!